This column kicks off The Evangelist's "I need mercy" series for the Year of Mercy, asking people from around the Albany Diocese to describe personal experiences of giving, receiving or struggling with mercy. Watch the paper for future columns by bishops, teens, a former inmate and more! In addition to The Evangelist's series, the diocesan Year of Mercy Steering Committee is seeking news on what local Catholics are doing for the Year of Mercy, to be posted on its webpage and social media. 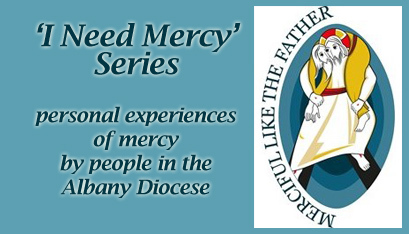 Email stories, photos and event announcements to yearofmercy@rcda.org. Include name, email, phone number, parish/school/organization and town, plus a description of the event or a synopsis of the story and any accompanying photos (with photo releases if any children are in the photo). As someone who endured decades of abuse, some may think that I may not be someone who believes in a merciful God. However, I am grateful to say that I am. Long before I had any memories of abuse, I needed to decide -- as all adults do, I think -- who God would be for me. I saw two choices: a God who would inflict pain on someone, or a God who would stand with someone in their pain. I opted for the latter. This would be challenged as memories slowly crept back into my mind and heart. As a person in recovery from addiction, completely turning away from God could have very serious consequences. I remember early recovery as a very difficult, confusing time: I needed God, but these memories turned my world upside down. Thankfully, I had someone who I felt I could talk to, whom I trust unreservedly, and that person suggested I seek therapy. I had done that before, so I protested, but I did it anyway. That began the long journey to the deepest part of my heart, to the memories that haunted me and caused me to feel so very unworthy. The healing of those memories has led to freedom. The therapist I saw would say on more than one occasion, "We both know that there is something bigger than us at work here." In time, I came to see that "something bigger" was the God I had chosen all those years before - a God who was standing with me in my pain, counting my tears. In the weeks and months that followed, as I poured out my heart in therapy and in prayer, I rediscovered that place within me that is God's. It is in that place that I believe God had always protected me. I had heard for many years that my mother prayed that I be born. God built a place just for me to be safe during times of abuse, and to go to in times of healing. The journey of healing is not always straight, but it does deepen. I have been given the strength, courage and patience to embrace the healing that I believe is God's deepest desire not just for me, but for everyone. I have also been given the courage to face someone who abused me, and set limits so that my heart could continue to heal. After that meeting, the first place I went to was a chapel. I stood there, crying, and said, "Thank you!" I cannot use the word "forgiveness" in referring to the persons who abused me. I have been able, with the help of God and therapy, to continually "let go" of the pain they have caused me, not allowing it to affect me as much in the day to day. This has all happened because of the presence of a merciful God who spoke to me first through my mother's faith, then through a trusted person's suggestion, then through a therapist's loving presence, and then, each and every day, through my finding the courage to live the life I have been given.